Body made of coconut fibres and natural rubber, handle and closure panel made of walnut wood (FSC-certified), polished with beeswax. Brass screws. Inside pocket made of cotton, 34 x 18 cm. Width 36 cm, height (without handle) 30 cm, depth 13 cm. Weight 720 g. The briefcase is made in a workshop for the disabled in Amsterdam. Exceptionally Robust and Rainproof. 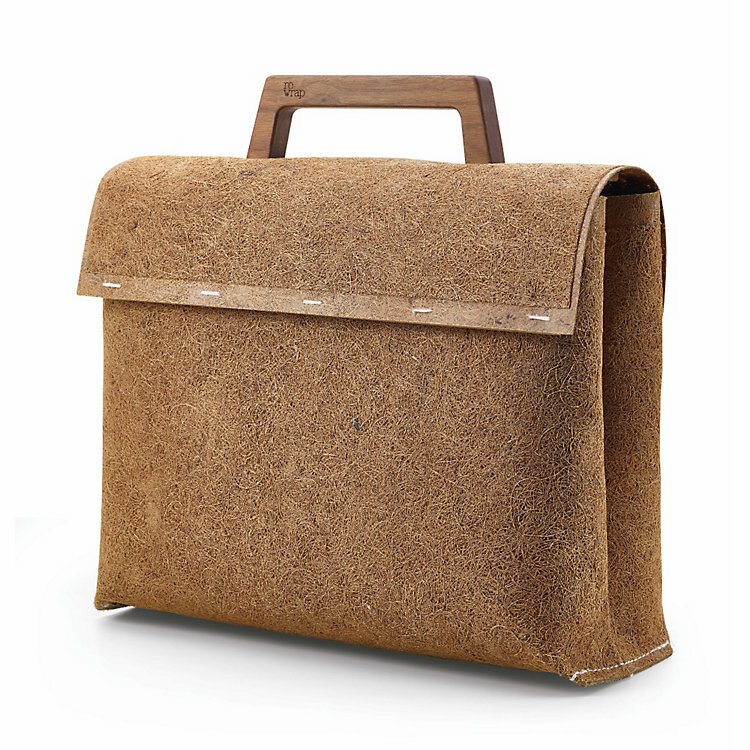 Briefcase Made of Coconut Fibres. Natural materials – and two small screws that secure the handle – are used to make this briefcase. Coconut fibres, natural rubber and walnut wood can all be reintroduced into the materials cycle at the end of their long service life as a bag because the bag is fully biodegradable if composted. Another benefit of the material is that it is ultra-lightweight yet capable of withstanding rough treatment – and it neither lets water in nor out! The Amsterdam designer has given the bag a minimalist look. The body of the bag is made from a 1.5-mm-thick mat pressed out of coconut fibres and a small amount of resin. Unlike most other materials made from coconut fibres, this product is made from the bark of the coconut palm rather than the fibres of the fruit. The rapidly renewable raw material is extremely tear-proof and resistant to mechanical pressure and moisture, guaranteeing the bag a long life. Over time, individual fibres may detach themselves from the mat and stick out. These can be simply snipped off (but should never be pulled out!). The inside of the briefcase is coated with sun-dried natural rubber, which is biodegradable, unlike vulcanised industrial rubber. The coating makes the bag rainproof, and it can also be wiped out if a thermos flask happens to leak. The handle and closure – two panels that run along the width of the external body and interlocking flap – are made of FSC-certified walnut wood. The bag is polished with beeswax to make it water-repellent and give it a smooth sheen. It is sewn with thread made of wood pulp.